Bob & Mary's Beach Retreat - Majestic Sun, Great Gulf Views*Pool*Free WiFi/Prkg. Majestic Sun Beach Luxury Resort Lifestyle. Enjoy, Relax, and Be Good to Yourself! Once you stay here....you will return!! Mary and I have been managing our 2 Majestic Sun properties for over 16 years, and work hard to provide each guest with the most pleasant experience possible. We have 2 condos in Majestic Sun, A-213 and A-313. If one is booked, please try the other one. You can go to our personal web site, www.majesticsunindestin.com to see both condos. 'Majestic'' is a great word for this resort! 2000 feet of magnificent open shoreline, spectacular east to west Gulf views of emerald green waters, sugar white sand beach, dolphins romping in the surf, and the most majestic sunsets anywhere, they all are a part of what you can soon call your 'home away from home'! Majestic Sun Beach Resort at Seascape, Destin, Florida. This is Majestic Sun, a luxury condominium resort, overlooking the Gulf of Mexico. Enjoy the many extras of this two bedroom deluxe vacation home, with the comforts and amenities you want and expect. * Play a round at the 18 hole Championship Golf Course. * Bask in the sun with 2000 feet of unspoiled sugar-white Gulf beaches. * Stay in shape with eight tennis courts and on-site, state of the art, fitness center. * Relax in our 3200 square feet, multi-level, indoor/outdoor pool with waterfall accents and 2 hot tubs, and tropical landscaping. * Stroll around fresh water lakes within the Seascape Resort. * Admire the stunning Gulf views from the balcony, living room, dining area, kitchen and master bedroom. Watch for the dolphins romping! * Capture the beautiful Gulf sunsets. Special enjoyable features include: * Open, bright floor plan with 2 bedrooms and 2 full baths. * Extra large floor to ceiling patio doors in living room and master bedroom with full Gulf views. * Breakfast bar seats 2 and complements dining area with seating for six. * Sleeps up to 6, with one king, two twin beds, plus a queen sleeper sofa. * Fully equipped kitchen, with microwave, dishwasher, ice maker, and pantry. * Full-size washer and dryer. Places to go: * Less than one mile to Silver Sands Designer Outlet Mall. * Destin Commons Mall, Grande Boulevard shopping. * Baytowne Wharf is a must visit, with great selections of food, shops, live music and fabulous atmosphere. Kids love it too. * Kids will love the 'The Track' miniature golf, go carts, water bumper boats and much more! * Big Kahuna's Water Park is always a favorite place for kids. * Golf...more than a dozen golf courses within 15 minutes of the condo. We chose Majestic Sun because of the gulf/beach views from our condo, indoor and outdoor pools, hot tubs, and fitness center. Within 1 mile of Majestic Sun we have the convenience of grocery, drug store, outlet mall, restaurants, banks, churches, and souvenir shops. We chose this location because we believe the Emerald Green waters and sugar white beaches are the most beautiful to be found anywhere. There are so many activities for families, children and adults. Mary and I have been managing our 2 Majestic Sun condos for over 16 years and provide the type of condo our guests expect. Our 2 condos are called the Deluxe model. One feature of that model is the master bedroom being located on the front, Gulf side of the condo. The locations of the condos are on the second and third floors. Guests like this feature since they can communicate with family and friends who might be on the pool deck area. There are full views of the Gulf/beach from the large balcony, master bedroom, living area, dining area and kitchen. NOTE: Majestic Sun has a policy that to rent a condo, the booking guest must be at least 25 years old and occupy the condo the entire time of the rental agreement. Violators of this policy will be evicted. The master bath and the guest bath have been updated in 2014 with new cabinets, granite counter tops, bath rugs, pictures, and shower curtain decor'. Full view of the gulf and beach from the double balcony, living area, dining area, kitchen and master bedroom. All linens are provided except beach towels. Fitness Center for Majestic Sun guests. State of the art equipment. Secured wireless internet. Password will be given to the guest. Kitchen was updated in 2014 with new cabinets, granite counter tops and stainless steel appliances and is fully equipped including crock pot, blender, hand mixer, coffee maker and toaster. Double sized balcony with entry from the living room and master bedroom. 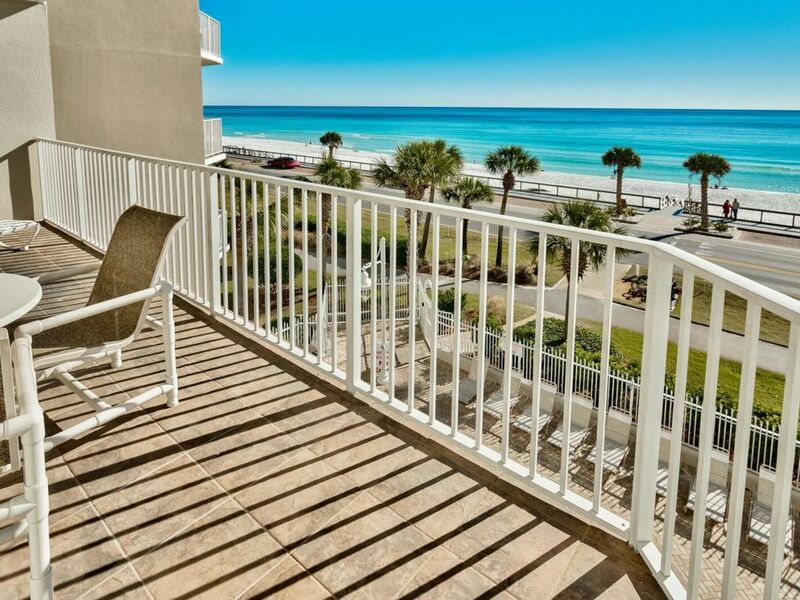 Enjoy the full view of the Gulf and beach from the balcony. Inshore and Offshore Fishing, Baytowne Wharf Village which is fun for all ages. 'Shopping' at Silver Sands Outlet Stores, Sun Bathing on the beach, Shop at Destin Commons Mall and Grand Boulevard, Deep Sea Fishing, Golf, Golf and did I mention Golf! Fitness Center, Miniature Golf, Amusement Parks, Tennis, Restaurants, Swimming, Snorkeling & Diving, Boating, Sailing, Water-skiing, Surfing, Windsurfing, Parasailing, Shelling, and much more! We had a great time in Destin, despite the less than perfect weather. The condo was great and in a convenient location! Thank you Bob and Mary for an unforgettable time. We all had so much fun in your beautiful, clean, a spacious condo! My kids loved having separate beds. We saw dolphins almost every single day. We swam every night, and the other guests were all so friendly. We met friends down there, and made friends along the way. It was simply perfect. We thank you for your hospitality, your reassurance that it would be wonderful, and your excellent communication since the beginning of our booking. We would love to stay again:) Thank you! Our condo was booked for the winter and you were our first Guests after snowbird season. It makes us so happy when our Guests have a great experience during their stay. Our indoor pool is excellent for night swimming or for getting little ones out of the sun in the summer. It's great the dolphins were there for you many times. We're glad Joey and Kaylie enjoyed their own beds so hopefully they will want to return also. Thanks again for being our Guests and let us hear from you again when you're ready to come back. It's always nice on a return trip because you already know what your vacation home is like. Very clean and spacious condo across the street from the beach. Very convenient to everything in Destin. Ocean views are amazing! We will be back! My family went to Destin for fall break and stayed at Bob & Mary’s condo. Unfortunately our trip was cut short due to Hurricane Michael. However, the condo is beautiful with everything you’d ever need. It’s spacious and has an amazing view of the gulf! It’s very convenient and easy to get to, and everything is within a few minutes. Bob and Mary are great people who were very accessible, pleasant, and hospitable. I can’t say enough about how nice they were to work with. We will definitely come back to this condo. It was perfect for our family of 5. Hopefully the next time we come, Mother Nature will be a little calmer 😉. Because of the hurricane Michael, you had the shortest stay in our condo I can remember. And even with that, you took the time to write a very nice review. Thank you so much. We look forward to having you back to pick up where you left off. and as you say, with the type of weather we are accustomed to having in Destin. Bob and Mary's Destin condo is a wonderful place. The condo was very clean and well maintained. Clearly they take great pride in presenting their best for those who choose to stay here. The owners were kind and cordial, and they were always available for any need (even though we had none, we knew they were there via both email and phone). The location is wonderful. The view from the living room and master bedroom was spectacular. The kitchen had every amenity necessary. I especially liked being on the same level as the covered walkway from the parking garage. This made it much easier to load and unload. I would definitely recommend this unit to anyone looking for a comfortable place to stay in Destin. I would also highly recommend dealing with these property owners. They made my family and I feel as if we were staying with friends. We will surely stay here again! Thank you for your very kind words. We know you had choices of where to stay and as we communicated with you early on, we were very pleased that you choose our condo. We hope your Mom enjoyed the trip and that the 3rd floor direct access to the parking garage was helpful. It is always gratifying to hear our condo met or exceeded your expectations. We truly hope you will return, as many of our past guests do. We had a wonderful stay at Bob and Mary's beach retreat. The unit is extremely clean and ideally furnished. It is in a perfect location close to the outlets, and many restaurants and shops are within walking distance..and the beach was absolutely beautiful! Bob was a pleasure to deal with and our family of four had a great getaway! Even though you had a relatively short stay with us, it was certainly a pleasure having you as our Guests. We appreciate your very kind comments about your condo. In fact we get many compliments about the cleanliness and furnishings. We have a wonderful Housekeeper, and I shared your compliments with her, (as I do with other reviews from time to time). Thanks again for being our Guests and we hope to have you back again soon. Golf: There are a minimum of 10 golf courses within 30 minutes of the condo. Many offer seasonal discounts or other special fees.